Throw a bit of magic over the decoration of your home and provide some mystical party ideas for a great night in. You’re bound to attract every pint-sized ghost, witch and wizard in the neighbourhood with your magical display. Welcome visitors with a pumpkin lantern on your doorstep. LED tea lights give off a great glow and are safer than an open flame. If you don’t have time to carve one, place whole pumpkins of different sizes on your doorstep. For a touch of magic use tea lights in glass jars. Decorate them with green sequins to add a bit of glitz and cluster them around the front door or hang them from the branches of a nearby tree. 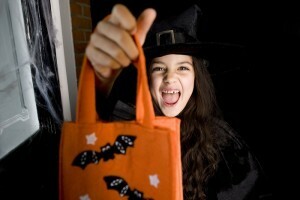 Halloween costumes can be flammable, so avoid naked flames or putting candles where children are likely to tread. Create a spooky atmosphere with fake cobwebs draped around the front door. If you’re crafty, try making a pumpkin wreath, a seasonal treat for your front door that will last well into winter. Create spooky silhouettes that can be stuck on your windows or front door. Cut out animal shapes such as owls, cats and spiders using black crepe paper. Try hanging them from string. Remember to dress up for the event. Answer the door in fancy-dress costume for the best effect. Play some scary music, to add to the spooky atmosphere – it’s bound to make the children giggle with excitement. Make sure you’ve got plenty of sugary treats to hand out. Oranges and nuts may have been the custom a century ago, but be prepared for some puzzled looks if you go down this route! If you’re out, leave a basket of goodies on the doorstep. Revellers can then just help themselves. Be cautious check the goodies at the end of the evening. Make sure what went into the bag is edible and safe. If you don’t want visitors turn your porch light off. Choose a theme for the party so your guests enter into the fantasy – i.e. a witch’s hovel or a pet cemetery. Serve drinks from your cauldron with dry ice to create a smoke effect. Serve hot ghoulish green soup served in test tubes or jam jars. Use icing and food colouring to create blood shot eyeballs, (otherwise known as iced fairy cakes). Sponge fingers can make fantastic witches talons. Throw a handful of bug shaped sweets into your green jelly for a truly disgusting dessert. Spun sugar can make great cobwebs. Select some music to set the scene. Worm Surprise – To get a real feel for Halloween try blindfolding young revellers before placing a pot of cold, cooked spaghetti in front of them. Ask them to stick their hands in and rummage for their prize. It’s bound to create a few squeals of excitement. Apple Bobbing – Halloween is sometime referred to as ‘Bob Apple Night’, named due to a traditional game that was often held this time of year. Find a clean bucket, barrel or washing up bowl and fill it with water. Put a number of apples into the water to float. We hope you have a spookily delicious Halloween at home this year.